W. Eck, P. Funke (éd. 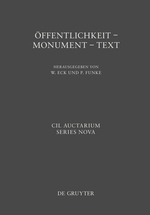 ), Öffentlichkeit-Monument-Text. XIV Congressus Internationalis Epigraphiae Graecae et Latinae - Akten, Berlin, 2014. The 14th International Congress of Greek and Latin Epigraphy focused on the importance of inscriptions as a form of public communication. Topics discussed include the ways that the communicative nature of inscriptions is expressed in the texts themselves and sometimes even more saliently by the monument that bears the inscription. The Acts includes the full text of all the main lectures and summaries of the section contributions.